VietNamNet Bridge – Viet Nam’s total sand resources are an estimated 2.3 billion cubic metres. With the current pace of construction, experts warn that the sand supply will likely be exhausted in less than 15 years. 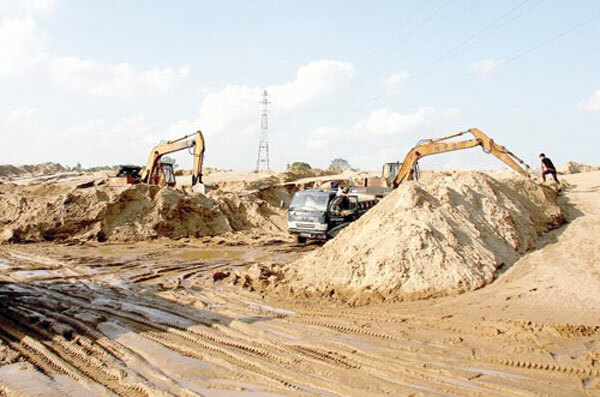 Dr Le Ai Thu, chairman of Viet Nam Association of Economic Geology, and Dr Thai Duy Sam, vice chairman of Viet Nam Building Material Association, spoke to the Vietnam News Agency about the necessity of finding alternative materials to replace natural sand. Many agents and contractors have claimed that the constant sand price increase over the past several months has been due to tight management of the Government and local authorities over sand exploitation. Can you explain? Le Ai Thu: A sudden increase in sand prices can have many different reasons. I think it is necessary to conduct surveys and investigations to have reliable answers. Thai Duy Sam: Sand is an indispensable material to produce concrete, mortar, bricks and floor levering. Our country has become familiar with using natural river sand. However, the over-exploitation and illegal exploitation of sand at rivers have caused serious consequences in many localities. As a result, the Government has strengthened management over the exploitation of sand rivers. Moreover, the source of natural sand in our country has been increasingly scarce, as sedimentation and restoration of sand mines are restricted by the construction of upstream hydropower plants. This is the reason of the recent price hike of sand. Many contractors have said that dealing with rising sand prices has been difficult, and finding alternative materials such as artificial sand has been even more difficult. What do you think? Le Ai Thu: In fact, river sand mining is a form of super-profit exploitation, and few minerals carry such a high profit. Therefore, various interest groups have sought different ways to be licensed to carry out exploitation activities. Riverbed sand exploitation brings profits for certain groups, but it causes a huge impact on the country. To prevent natural resource waste and to mitigate adverse impacts on socio-economic development caused by river sand mining, State management agencies must fulfill their responsibilities, including banning all exploitation activities at rivers at risk of erosion, prosecuting organisations and individuals for illegal exploitation. The use of alternative materials to replace natural sand will be of course implemented in some areas facing construction sand shortage. It should be noted that construction sand is not only exploited at the riverbed but also in various areas. In the world, sand exploitation isn’t only implemented in the riverbed. Alternative materials, which are made from rocks, are much more effective. Thai Duy Sam: Sand substitutes have been used for ten years. There are sand substitute materials that ensure the functions of sand such as ash, blisters and plaster. However, these materials are not popular. partly due to consumer habit. Recently, Prime Minister Nguyen Xuan Phuc approved the Decision No 452/2017 on boosting the treatment and use of ash, slag, and plaster of thermal power plants, chemical and fertiliser factories as construction materials. The decision’s goal of treating and using about 75 million tons of ash, slag, and plaster for construction materials by 2020 will help protect the environment and minimise the use of natural resources. In my opinion, first of all, it is necessary to use the sand properly, economically and for the right purpose. Secondly, the production and use of artificial sand from rocks or construction waste, industrial waste, mining waste should be boosted. According to the Government’s master plan for construction material development, the demand for building sand of our country was 92 million cubic metres in 2015, and it will be 130 million cubic metres per year by 2020. In the long run, it will be difficult to meet such demand, because sand is a scarce resource. What measures should be taken to reduce the demand for natural sand? Thai Duy Sam: First, the State must manage the exploitation and use of natural sand strictly, further explore and specify accurately the reserves and quality of sand mines, draw up plans for the rational exploitation of natural sand and have strong sanctions against unlicensed exploitation activities. It is then necessary to promote the production and use of artificial sand from natural rocks and construction waste, industrial waste and mining waste. Recently, the Institute of Building Materials has studied successfully the technology of producing artificial sand from rocks and construction waste. Son La and Lai Chau hydro-power plants have used this kind of materials. Thien Nam JSC in northern Quang Ninh Province has produced artificial sand from coal waste, which was announced to be 18 per cent cheaper than natural sand by the provincial Department of Construction.